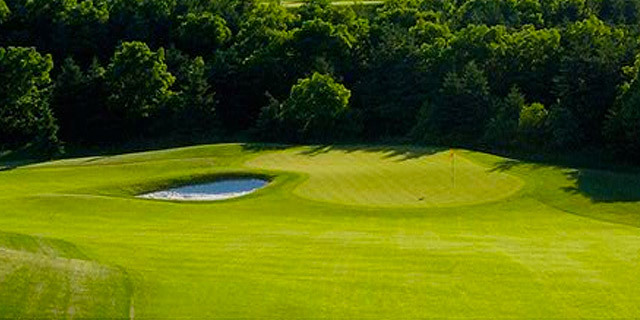 Situated on the shore of Lake Scugog in the residential community of Canterbury Common, this Doug Carrick designed 9 hole golf club is Port Perry’s most beautiful golf Ohio white sand bunkers and water hazards line the perimeters of fairways and greens to challenge players not at the top of their game. Canterbury’s sixth hole is possibly Scugog Township’s most difficult hole. This sharp dogleg left is 352 yards of narrow fairway with water the entire length of the hole on the left side and a sharp drop to un-playable terrain on the right. An accurate drive off the tee will set you up for a decent approach, stray off the fairway in either direction and you’re setting yourself up for a few extra strokes.